Here are just five of many ways to impress your guests (and yourself) while actually adding convenience and resale value to the design of your kitchen. Place your dishwasher diagonally into a convenient corner. It looks great and saves the cost of an expensive and inconveniently accessible cabinet. Step your sink cabinet forward (at least 3) to add interest and reduce the amount of water that ends up on your window or window treatments. Place a 13 television into the top of a diagonal corner cabinet. Its a great place to let the whole family view without the screen being blocked, (not to mention the savings in counter space). Place your range or cooktop diagonally into a convenient corner. With proper planning, it can reallocate counter space for better function and provide better space for pot and pan storage. Adequate lighting is a must, but its rarely specified. Consider strategically placing recessed and/or under-wall cabinet lighting to accent the beauty while allowing you to actually see what you are creating! 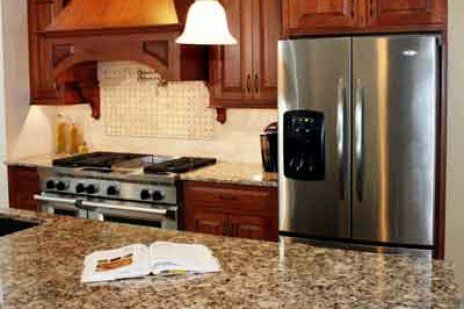 These are just a few of the techniques used by an experienced kitchen designer to enhance the functionally and esthetic appeal of your home. We can show you many more ideas to make your kitchen the envy of your neighborhood.